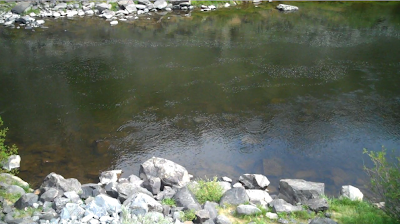 Went to the Mighty Mighty Mo this weekend to fish for it's monster rainbows and browns. Stopped by Headhunters Fly Shop for some nice flies and good advice. Fished between Holter Dam and Craig. 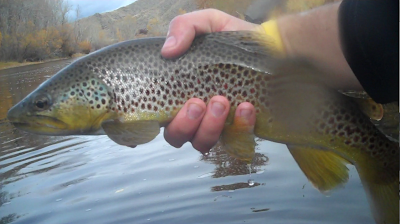 With party cloudy to mostly sunny weather in the mid- to high 30s, we were hoping to get into some midgy dry fly action. 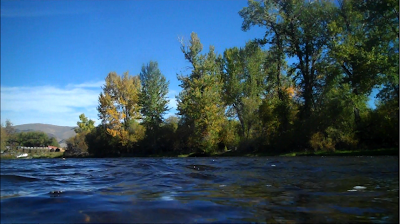 But, when 12:30 pm hit, the wind came with it and all hopes for dry fly fishing were dashed. There were some sporadic rises, but never enough to fish to risers. It was nice to see large trout feeding at the surface during these long winter months. While we didn't get into any monsters, Bucko and I caught some solid rainbows between 17 and 20 inches. I ended up with two rainbows, both around 19 inches. Bucko caught 7 trout, but he also caught two whitefish, so that hurts his overall score. I did have a shot at a 19 to 21 inch brown trout later in the day, but it's acrobatic run loosened the size 18 lightning bug out of it's mouth. I spent all day with water up to my right thigh. I have some massive leak in my waders that I cannot find. My left leg feels left out of the water party. It can't wait until spring and summer when it will finally get a chance to feel the rush of cold water during the wet wading season. The highlight of the trip was the wintery double we brought to the net. More than 3 feet of rainbow represented in two nice specimens. Yes, the famed Double Rainbow. In this video, I pay tribute to the double rainbow guy. If you haven't seen it yet, do it now. Then watch this (in HD on vimeo). Double Rainbow Trout on the Mo from Ivan Orsic on Vimeo. Another brilliant documentary from EP Films, The Flathead Wilds is about the unprotected headwaters of the Flathead River in British Columbia. The North Fork of the Flathead, which flows south into the United States was listed as one of the ten most endangered rivers in 2009 by American Rivers because of proposed coal mining in its headwaters. The film tells the story of the North Fork as it follows a group of outdoors photographers. It is well worth the 20 minutes or so and some of the pictures that they capture are absolutely ridiculous. I have spent time in Glacier National Park and have driven through Waterton Lakes National Park and I can honestly say, that this film captures the beauty of the landscape as well as it could be. An excellent watch. 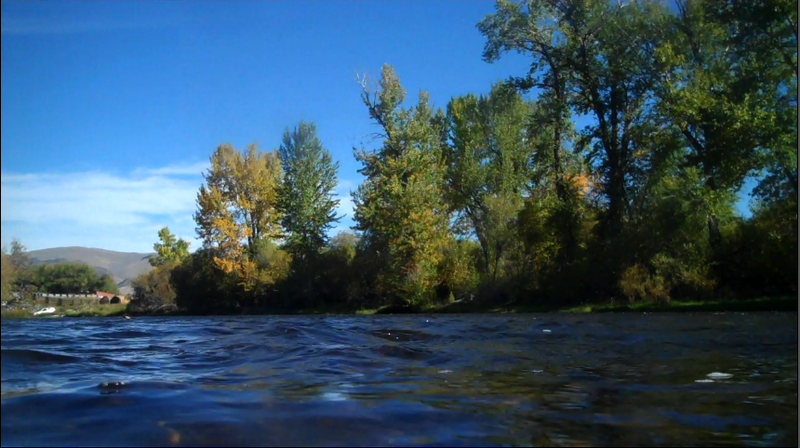 Flathead Wild ReEdit from EP Films on Vimeo. A very interesting discussion about a recently proposed bill that would ban felt-soled boots on Montana waters is taking place over at Headhunters. Join in. 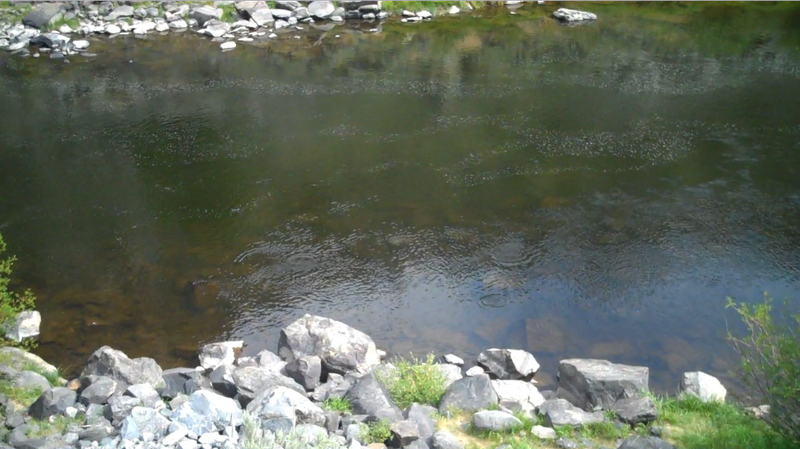 I went casting on the Bitterroot just outside of town and down near Florence Bridge, this past saturday. Tried to catch fish, but i suspect (and secretly hope) that the cold weather and incoming cold front slowed the fish down. I saw a handful of rises, a little more than a handful of midges, one muskrat, a pooping dog, a couple homeless people's humble abodes, a deer with what appeared to be a huge gunshot hole around it's jaw, four bald eagles, three herons, and one dead four-point whitetail mid-channel. I also realized that I have enough pinhole leaks in my waders to warrant a wash and patch session in the very near future. I could have filled a water bottle with the near freezing water in my waders and absorbed by my sock. No fish to net and as a result, there was very little useable video footage. So, I revisited an old video from I made in late June 2010 titled "another day on the rock". It is exactly what the title suggests, a day of fly fishing on upper Rock Creek. I wanted to remix the video to a new song with a new look at the footage. I tried my hand at a little "stop-motion." I did my best to align the clips with the hi-hat in Guru's "Lifesaver" from the Jazzmatazz Volume II album. If I am being honest with myself, the video has it's moments (both good and bad). This method highlights some details that might be lost in normal video including the fact that (at least in June 2010) I started backcast too early. Also highlighted by the stop-motion is a pale-morning dun in flight around 1:26. Do not adjust your computers - most of this video is supposed to be choppy. Tell me what you think. Should I use this technique for any of this year's upcoming videos? Or should I drop it as quickly as David Akers missed two important field goals this sunday? another day on the rock revisited from Ivan Orsic on Vimeo. Watch in HD on vimeo. Oh, yeah, ygf is on the facebooks. like it on the facebooks, even if you don't in real life.